I’m reviving the “Lace of the Month” feature, and starting out with something rather unusual. Whenever I don’t have enough money to buy lace, I buy postcards. I have a lot of postcards. The example I have chosen for February is the only image I know showing a Belgian ‘Kussen’ maker in his shop. 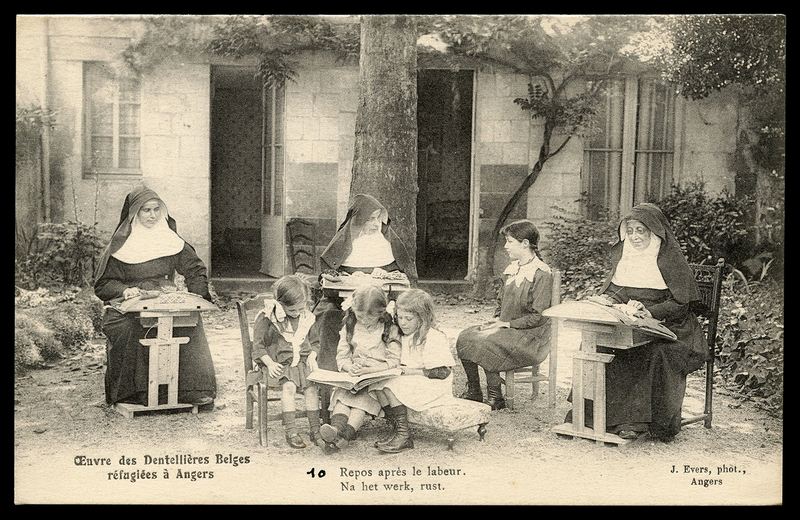 Ypres was totally destroyed in WWI, and this image is part of a set recording the activities of Belgian refugees in Angers, France (the capital city of the former duchy of Anjou). 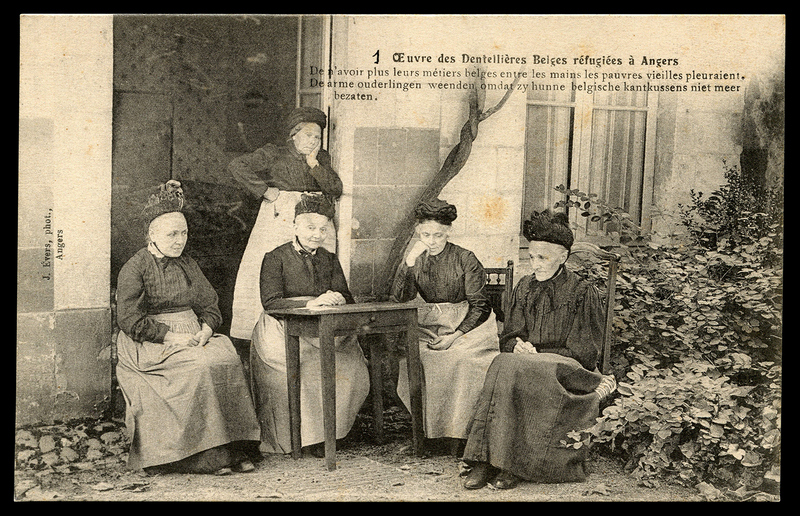 The caption reads “Fortunately the manufacturer of Ypres lace pillows has found refuge in Angers”. 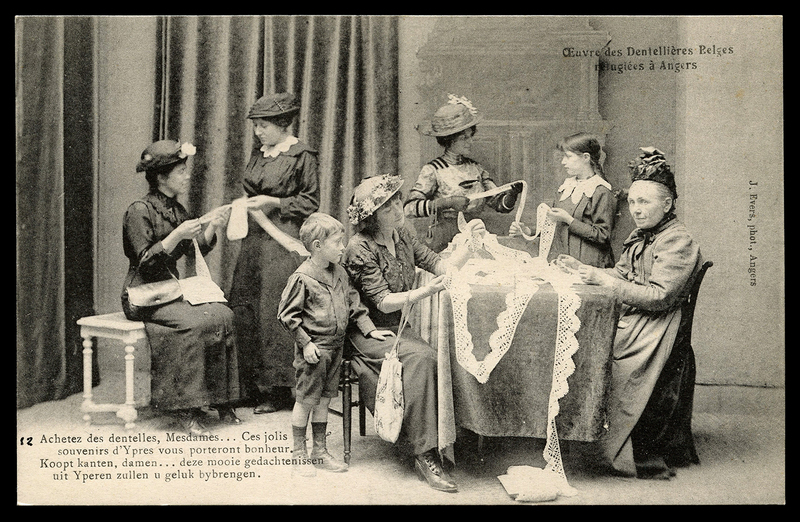 The postcard is labeled J Evers, phot., and it is slightly irregular in shape. The little boy helping out in the shop is an image I’ll never forget. 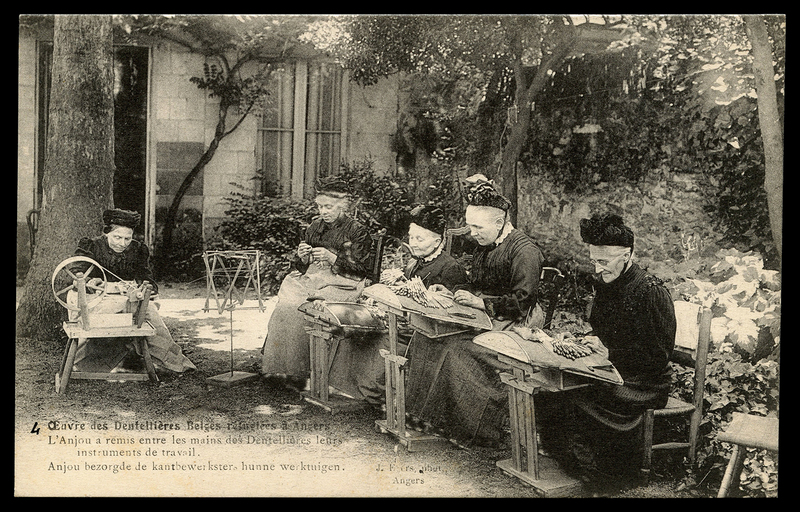 Making the two-part ‘kussen’ was a cottage industry in Belgium, but virtually no historical manufacturers have been recorded. They were largely stuffed with wool, sometimes horsehair. Maybe now you can get an appreciation of all the handwork that went into making them. If anyone has any information on this amazing industry, please comment. 3/22/2016 I have now obtained the entire set of 12 postcards. I don’t know the whole story behind this set and the story it tells. But there must be something behind the unusual subject. 1. The poor old women weep because they no longer have their Belgian equipment in their hands. 2. 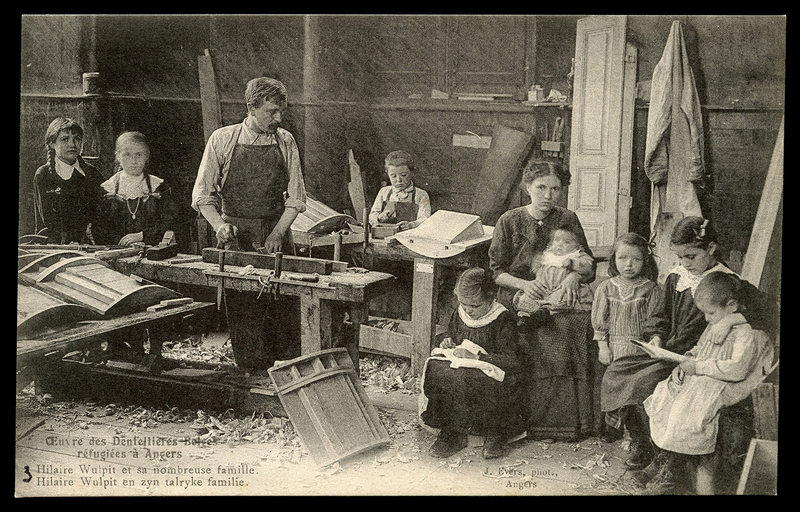 Luckily the manufacturer of Ypres lacemaking equipment has found refuge in Angers. 3. Hilaire Wuipit and his numerous family. 4. 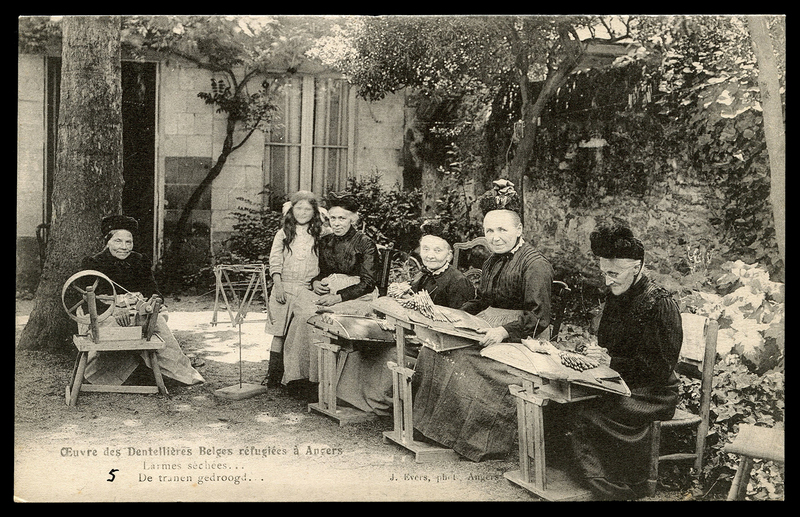 Anjou has provided the lacemakers with the instruments of their work. 6. Three inseparables: Leonie, Sidonie, and Pietje (their bird). 7. 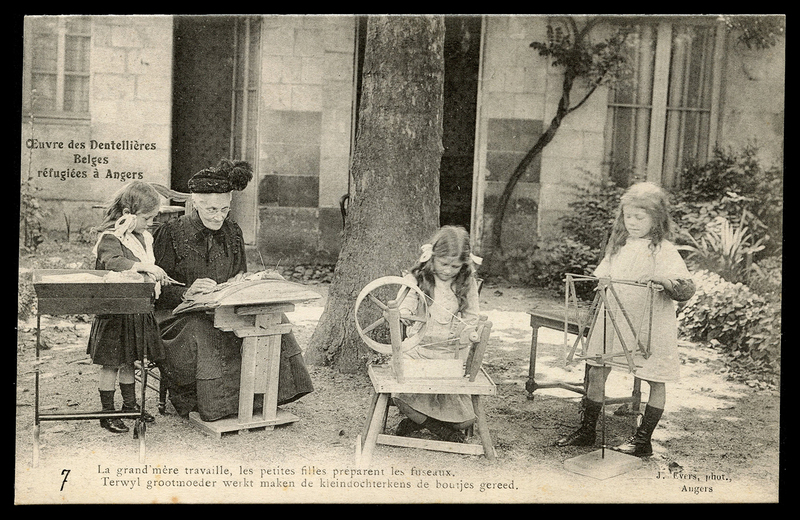 The grandmother works, and the young girls wind the bobbins. 8. 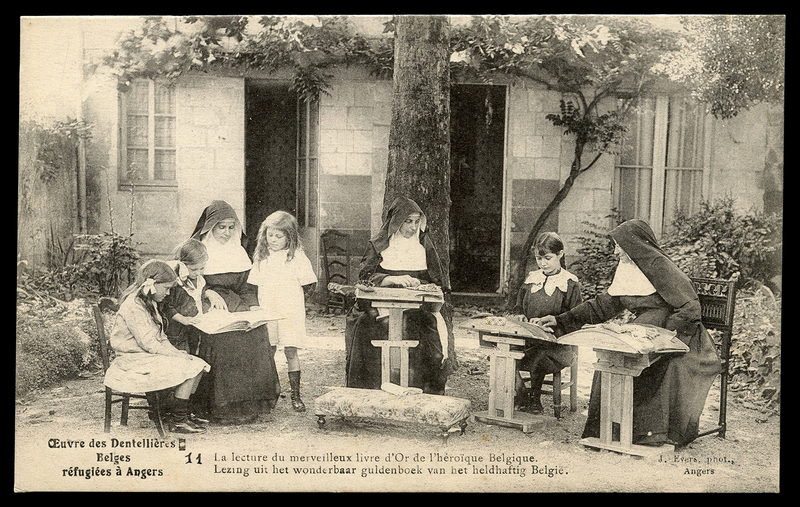 The sisters of St-Joseph d’Ypres in Angers. Their house often shelters the dear soldiers of Anjou. 9. 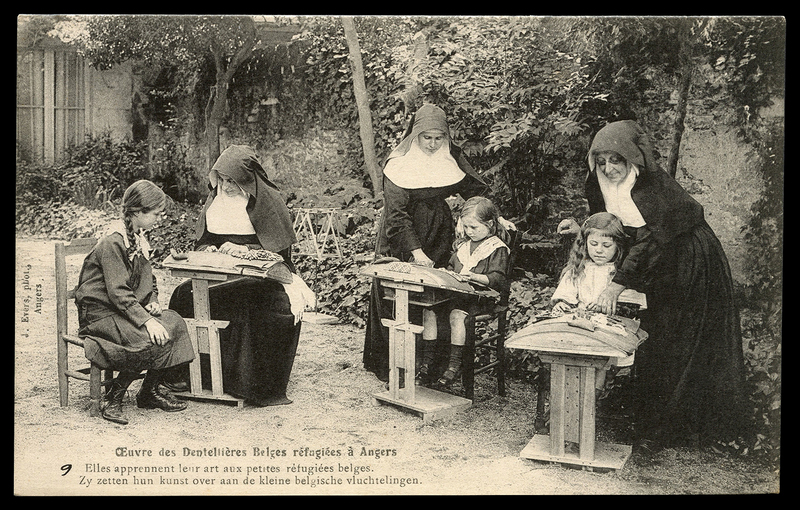 They teach their art to the young Belgian refugees. 10. Resting after their labor. 11. A lecture from the marvelous “livre d’Or’ of the heroic Belgians. Here is where dates become confusing. 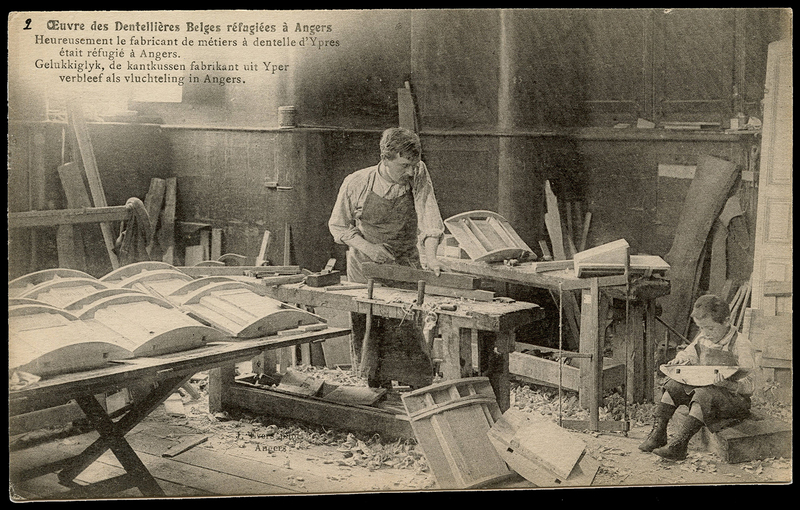 The only reference to a “livre d’Or” that I can find (http://tinyurl.com/hvkg47e) is a work which records decorated Veterans of WWI in Belgium, and was first published in 1933. The costumes in the cards look earlier than that, so perhaps it refers to another book. 12. 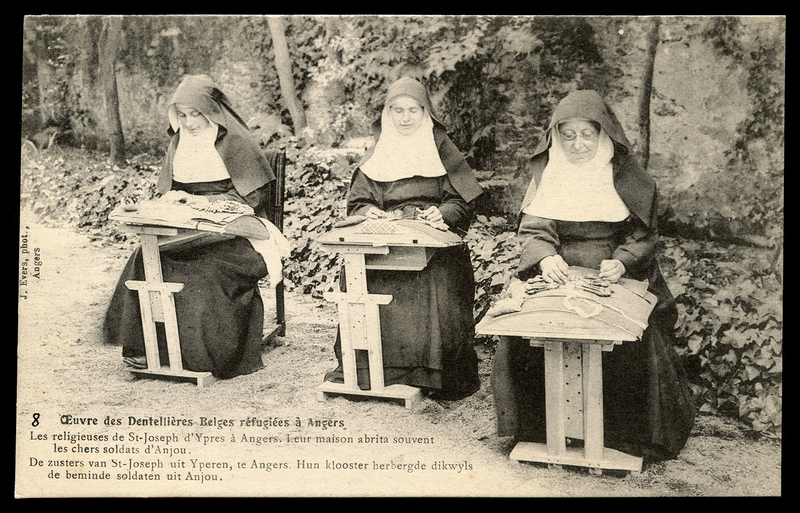 Buy lace Mesdames … These pretty souvenirs of Ypres will bring you luck. Thank you. I joined for the Ebay Alerts. This is an enjoyable surprise, please continue. I found the postcard was extremely interesting. Thanks for sharing. Thank you Laurie. The presence of the little boy makes a compelling image. 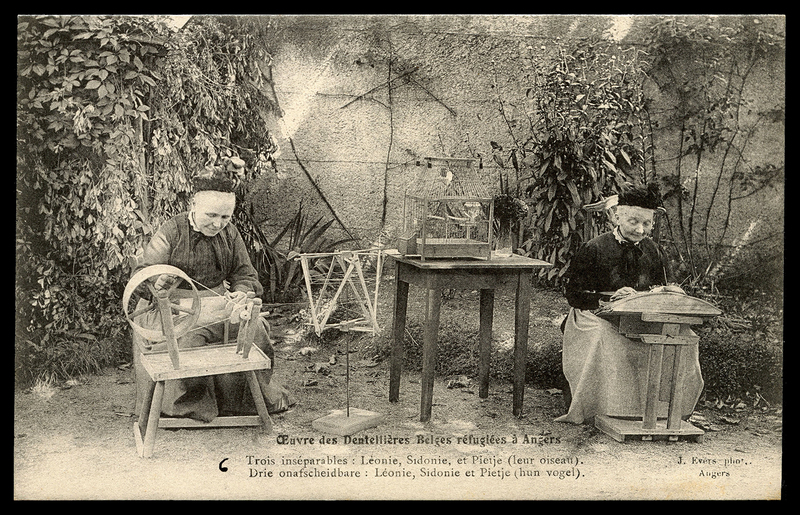 He is on task, sanding the back of the ‘kussen’ with a square of sandpaper; under Papa’s gaze. So interesting to see the workshop. Is it unreasonable now to want one of the pillows? !